Additional Info: Acclaimed for his “fluidity of tonal colour’ and “highly communicative, musically intelligent, impressively insightful’ playing, JOSEPH SHINER is currently building a dynamic performing career in the UK and abroad. He is the recipient of the Hattori Foundation Senior Award, the Worshipful Company of Musician’s Maisie Lewis Artist Fund, the Making Music Philip and Dorothy Green Award for Young Concert Artists, the Royal Academy of Music Buffet Crampon Clarinet Prize and the Royal Academy of Music Keith Pearson Memorial Prize. Joseph has played principal with orchestras such as the Britten-Pears Orchestra, Orpheus Sinfonia, and London Pops Orchestra, and is steadily developing a freelance orchestral career. As well as being a founding member of the dynamic chamber group ‘Magnard Ensemble’, Joseph plays in a regular duo with Frederick Brown, which has been reviewed as ‘a very strong duo partnership… one to watch’, as well as enjoying collaborations with the Endellion and Alauda Quartets. Joseph is highly active in contemporary music, his repertoire extending through Goehr and Berio to Nico Muhly, John Adams, and an expanding number of commissions, from composers such as Misha Mullov-Abbado, Kate Whitley and Ian Morgan-Williams. In 2012 he accepted an invitation to the Atlantic Music Festival, Maine, USA, as a Contemporary Ensemble fellows. During the four weeks of his residency Joseph premiered thirty-eight works by composition students, fellows and faculty members, including Curtis faculty members Daniel Shapiro and Robert Paterson, as well as Gravemeyer Award-winning composer George Tsontakis. After studying at Wells Cathedral School with Dr. Kevin Murphy, Joseph read Music at Gonville and Caius College, Cambridge University, where he graduated with Double First Class Honours, followed by postgraduate study at the Royal Academy of Music with Mark van de Wiel, Angela Malsbury, and Chi-Yu Mo. He was supported in his studies by the Royal Academy of Music, the Stanley Picker Trust, the Kathleen Trust, the Countess of Munster Musical Trust, the Michael James Musical Trust, and a Musicians Benevolent Fund Postgraduate Performance Award. 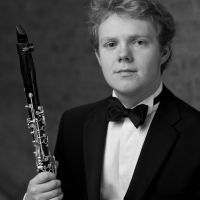 He currently studies with Patrick Messina (principal clarinet of Orchestre National de France).